I have a crazy science-garden experiment going on here. Through details too embarrassing to divulge, I ended up with several small containers of tomato seeds in the first stage of saving. This is when you plop them together with the pulp in a small cup with airtight lid, add a little water, and let them sit. The next step is, after they’ve had a few days to mold over, thereby sterilizing and protecting the seed, you’re supposed to remove any fleshy pulp and set the seeds out to dry on a windowsill on clean, dry paper towels. Suffice it to say I didn’t get that far. I think it may have been a repressed fear of what I might find that made me late with my planting this season. It was a tipping point trip to the grocery store, dreading in a month or so being forced to purchase the tasteless rubbish that passes for tomatoes, when last year I had probably twenty or more different heirloom varieties in my own backyard, that I decided I had to give it the old college try. Probably nothing will come from these. It’s so late in the season I’m unlikely to get any actual fruit (though the season’s been weird already so there’s no way to know if we’re not headed for a long one). I’ll be surprised if anything at all actually grows out of these seeds that were still wet from last August when I planted them today. As blush-worthy as my blunder (inadvertence, procrastination, forgetfulness — I’ll never fess up so call it what you will), it makes for a possibly interesting experiment. I’ll let you know if I see any seedlings any time soon. Several of the subjects went into recycled plastic planter containers. These included the Kellogg’s Breakfast seeds from a couple heirloom tomatoes I bought at Amsterdam Market late last summer, a Dr. Wyche (an orangish yellowish beauty), and another one or two in recycled planters. 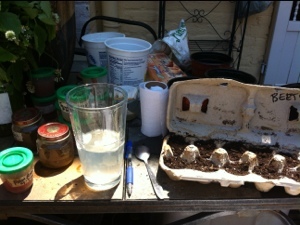 The rest i used repurposed compostable egg cartons. The Paul Robesons have one row, while the Jaunne Flame has the other. Just one little unit holds the seeds of what I only had the wherewithal to call the “best tasting tom. of 2012.” Despite my abuse of the poor things once I’ve extracted the seeds for saving, I’m usually pretty good about labeling, especially since I have delusions of some time in the future having enough time to post some of mine on a seed exchange and it would be unethical to not be certain the variety. Really not cool and not fair to guess at something like that, especially when all heirloom varieties are at varying threats of extinction. But on that particular day, I was obviously not so careful. But, time will tell…or it might not tell me a damned thing. In the meantime and between time, I know I will sleep a little better tonight knowing at least most of those soppy seeds are now nestled into their little egg beds, carefully laden with blankets of compost, organic potting soil, bumper crop soil builder, and vermiculite just to make it a party (and keep the others from clumping together like a gaggle of awkward wall flowers). Progress (or lack thereof) reports to follow….. QUESTION: what’s your garden confession? Go ahead … I won’t tell anyone … Gimme the dirt! My various containers, bought and recycled are getting along nice in spite of a late start. Although I mowed the yard to get it looking less wild-like, and raked the portion I’ve used to plant, I have nothing planted in the ground. To a casual observer it looks full, but I know better. It’s full of wild violets. For whatever reason those things seem to love my yard. They are edible, and on occasion can be found in a salad but they are not there by choice- but don’t tell anyone. I may still try putting a few things in the ground, but for now I am thinking more along the lines of a fall garden. On the container front I have been trying something different. Transplanting a small banana plant a couple weeks ago I discovered that the bottom of the pot was dry- I mean soil falling to the ground dry. It was in a plastic pot which holds moisture better than clay. Lately I’ve been watering by filling the dishes under the containers and letting it soak from the bottom up. I have heard that was better and helped roots grow down instead of staying near the surface. The downside of this is watching that the tray doesn’t stay full and over water, but so far so good. I think that using leaves in the bottom of pots instead of gravel helps the process. I don’t know how many new culms my bamboo has grown this season. I spotted another new one this morning. I uncovered the soil to expose the root, pulled it up and cut it off. Sshhhh- your not supposed to do that this time of year. Anyway I put it into a pot in yet another attempt to start another plant. I’ll see how it goes this time.